Monica Maechler has been a member of the Board of Directors of GAM Holding AG since April 2018. She has also served as a member of the audit committee as well as the governance and nomination committee (since April 2018). Monica is a member of the Boards of Directors of Zurich Insurance Group Ltd. and Zurich Insurance Company Ltd. (both since 2013) as well as of Cembra Money Bank Ltd. (since 2015). She also contributes to non-profit organisations as chair of the Advisory Board of the International Center of Insurance Regulation at the Goethe University in Frankfurt and as member of the Boards of the Europa Institut at the University of Zurich and of the Stiftung für schweizerische Rechtspflege. Additionally she teaches and publishes on topics related to financial markets regulations, private international law and business law. Monica served as member of the Supervisory Board of Deutsche Börse AG from 2012 until May 2018. From 2009 to 2012 she served as vice chair of the Board of Directors of the Swiss Financial Market Supervisory Authority FINMA, after having been the director of the Federal Office of Private Insurance from 2007 to 2008. She chaired the technical committee and was a member of the executive committee of the International Association of Insurance Supervisors until 2012. After her JD at the law school of the University of Zurich in 1984, Monica practised as an attorney-at-law in a business law firm in Zurich. 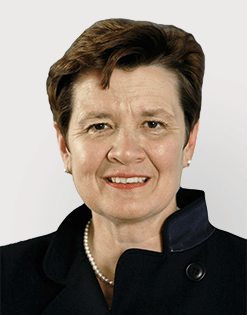 In 1990 she joined the group legal department of Zurich Insurance Group, where she became the group general counsel and head of the board secretariat in 1999 and was promoted to member of the Group Management Board in 2001. Monica also served as a member in several expert commissions on financial market regulation of the Swiss Confederation. She is a Swiss citizen.